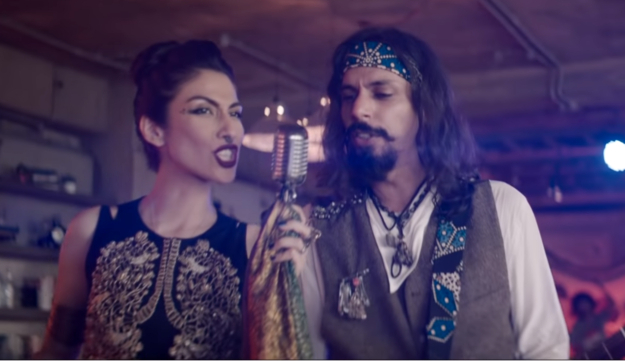 Pakistanis have been eagerly awaiting the upcoming season of Pepsi Battle of the Bands. Season three will see the return of Meesha Shafi and Fawad Khan as the judges with Atif Aslam and Shahi Hasan being replaced by Bilal Maqsood and Faisal Kapadia from Strings. But if the opening songs of the new series is anything to go by, Pepsi Battle of the Bands is going to be even bigger and better this year. The promo – which released online on Thursday – features all the judges, along with finalists from the last season. Yup… that means Kashmir and Badnaam are back! As the video kicks off, Kashmir is seen making its way to the stage. The band performs its original track Kaaghaz Ka Jahaz, which the season two winners sang last year. And much to our surprise, heartthrob Fawad joins them on stage! Now usually, it’s the new bands and singers who perform covers of old hits or senior artists. But the best part is how Fawad sings Kashmir’s song instead. Meesha joins the runners up Badnaam while performing in a studio. Together, they sing a rock version of popular folk song Kala Jora Pa. Of course, Meesha was the right choice for it as she brings just the right vocals needed for such a hard-hitting track. Honestly, Pepsi Battle of the Bands couldn’t have chosen a better opening track! Both the song and video capture the true spirit of music and the thriving, young talent of Pakistan, which the show is all about. Mind you, the reality show is coming up with epic celebrity reunions, as was seen when EP graced the show last year. There are also reports that we may get to see Junoon perform on the Pepsi Battle of the Bands stage this year as well. Or perhaps Ali Sethi could join Ali Azmat? Or a collaboration between Attaullah Khan Esakhelvi and Josh would be great too.